I have always had trouble with coffee table books. Sometimes it was the size of the book that made it cumbersome, other times it was the content. Basically the author tried to cram too much information into one book. So that has left me on the fence where these books were concerned. I am seeing as I continue with this blog that as my horizons expand on baseball subjects, so does my taste for the coffee table books. I have found another one that I liked that was worthy of being shared. This book has some incredible pictures of some iconic ballparks. That is the short version of why I am fond of this book. It takes a look of some of the most famous and historical stadiums in baseball history. Places such as Ebbets Field, Old Yankee Stadium, The Polo Grounds, Fenway, Wrigley and Tiger Stadium. 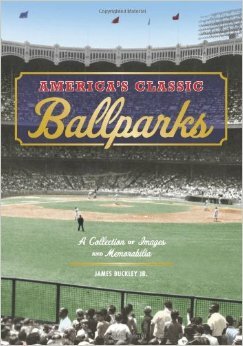 The book gives the reader a look at some seldom seen photos of both the inside and outside of each ballpark. It talks about some of the historical events that happened in each palace, as well as some of the characters that called it home. Each ballpark is given its hard-earned due. It respects the rich history at each place and shares with the reader the great qualities that each place has or had. Another cool aspect of the book is that it almost a pop-up book for adults if you will. For each ballpark, it gives you little pieces of memorabilia for each place. It could be postcards, ticket stubs or reproductions of programs from historical games. Each stadium has its own pocket these little treasures are contained in so they don’t get lost. It’s a neat little feature that you don’t normally find in these books. I was surprised by this one and thought it would just be another stadium book, but it earned its space in the bookcase. I realize coffee table books sometimes are not worth the space that they take up in your bookcase, but this one is different. Even though it is over-sized, I don’t think you will be disappointed by giving this one a chance. It will add a special something that you don’t usually find in these type of books. If you are the fan of any baseball team, then at least once you have had a horrid season. The type of season that no matter what you do you can just not shake the memory. For fans of the 29 other teams in the league, they can take some pride in the fact that they are not the all-time worst…….hey that honor has to go to someone, right? Well, congratulations New York Mets fans, the honor is all yours. The proud owners of 120 losses in their inaugural season in 1962, the New York Mets set a new record for futility that has yet to be broken over 50 years later. Now there is a book that allows you to relieve the highlights, or low-lights, depending on how you look at it, of that first season. There is a whole series of the “Tales From the Dugout of….” books available for various teams out there right now. They all follow the same basic premise of highlighting a certain team or season to the delight of that team’s fans. They are targeted to a very specific market and may not appeal to all baseball fans. 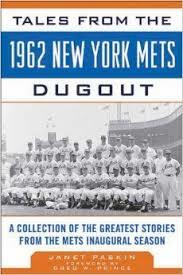 This specific book from Janet Paskin allows readers to look at the Mets 1962 season. Each chapter highlights specific moments in the season that were of historical significance. It also takes a look at player performances and antics during the season, on and off the field. The final piece of the book takes a where are they now approach and tells the reader what happened to the individual players after 1962. Unfortunately, these are the same old stories you would hear as fans about the 1962 New York Mets. I am sure its very hard to come up with new material about a single season more than a half century later. While historical for it being the Mets first season and the record-setting loss total, nothing really historical happened within baseball. There was nothing groundbreaking that would make it a season to be remembered for all time. If you are a Mets fan, the stories in this book you have probably heard 100 times before. That being said you will probably enjoy reading them for the 101st time. If you are not a Mets fan, this will have a hard time holding your interest, unless you really enjoy stories of ineptitude on the baseball diamond.